At Southport, we all wear a few different hats, so in addition to being the Marketing Manager part of my duties also include warranty and customer service- two very important aspects when it comes to a fully satisfied and happy Southport owner. Because of this experience I’ve got a birds-eye view of the common questions and concerns from Southport owners, both old and new. In the coming posts I will cover a few of the most common questions and concerns we hear from owners. Southports come standard with a very nice suit of cushions that are ready for whatever you want to throw at them, be it fish blood and guts, salt spray, or maybe even a splash of vino. While they’re made with the highest level of craftsmanship and top-notch materials, a little TLC along the way will ensure they still look as good as new a few years down the road. Put them away when they’re not going to be in use for more than a few days at a time. The sun is the biggest threat to the lifespan of the cushions- especially in Florida. Rinse the cushions and allow to dry. 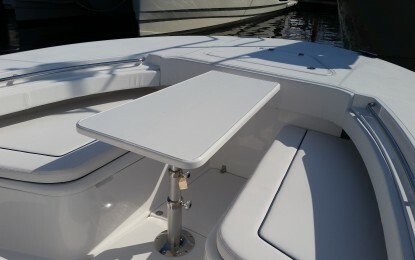 While Southports are dry boats, a fine salty mist inevitably covers the cushions anytime the boat is used. This salty spray, especially when combined with harmful UV rays, will attack the cushions, so rinsing after every trip is ideal. Before the cushions are stowed inside the console, give them time to dry to prevent any mildew or mold. Long term storage: In the off-season, especially in the north, take the cushions off the boat and bring them home. They deserve that kind of treatment and will be much happier in the relatively cool and dry conditions of a basement than they would be sitting on the boat in a dark, dank environment under shrink-wrap for 4-6 months. A little bit of treatment/protectant solution will help keep their finish as well as repel water. Ask your local marine canvas shop or marine detailer for a product that will work best for where you live. In the next post, I will talk about pumps and how to keep them happy and operational for as long as possible. Well cared for cushions will keep the boat looking brand new for many years. Southports come standard with a very nice suit of cushions that are ready for whatever you want to throw at them, be it fish blood and guts, salt spray, or maybe even a splash of vino.